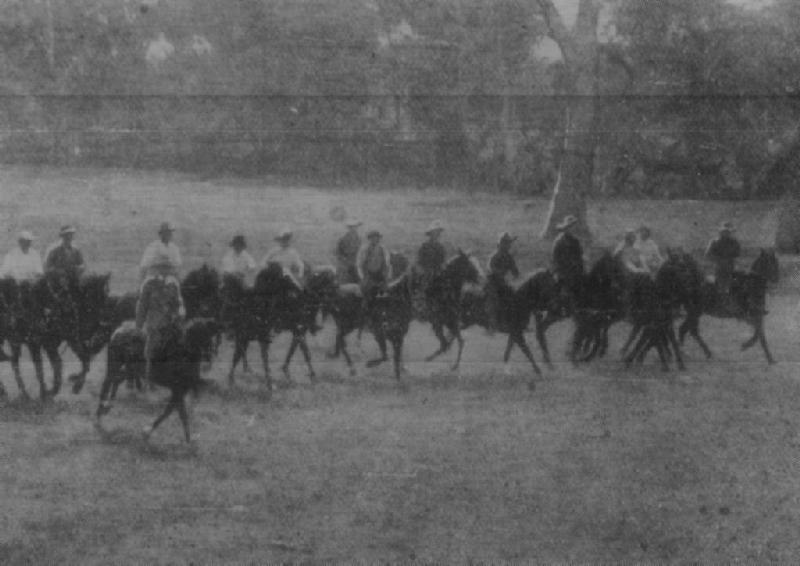 10th Light Horsemen undertaking mounted drill, Guildford, Western Australia, December 1914. The 10th Light Horse Regiment was formed as part of the 3rd Australian Light Horse Brigade, 3rd Contingent and attached to the Australian Division. The 10th Light Horse Regiment went through two distinct phases during its formation. Initially, it was envisaged that the unit would be designated as "C" Squadron, 7th Light Horse Regiment as part of the 2nd Australian Light Horse Brigade. The 7th Light Horse Regiment was to be a composite regiment based and trained in Queensland with "A" Squadron and Headquarters recruited in Queensland, "B" Squadron from South Australia with Western Australia providing the "C" Squadron. However, recruitment produced an overflow of men in all states. The result was the cancellation of the original structure of the 7th Light Horse Regiment and this regimental designation now applied to a unit raised in New South Wales. With the creation of the 3rd Australian Light Horse Brigade, "C" Squadron, 7th Light Horse Regiment was renamed "A" Squadron, 10th Light Horse Regiment. The 10th Light Horse Regiment was made up by recruits entirely drawn from the 5th Military District [Western Australia]. The 10th Light Horse Regiment was established at Guildford Training Camp to the east of Perth, Western Australia, and later at Rockingham Training Camp to the south of Perth. Training for the 10th Light Horse Regiment occurred originally at at Guildford Training Camp to the east of Perth, Western Australia, and later at Rockingham Training Camp to the south of Perth. Reinforcement training occurred at Blackboy Hill Training Depot. Embarkation of the 10th Light Horse Regiment was accomplished in two groups using both the HMAT A47 Mashobra and HMAT A52 Surada from Fremantle, Western Australia. The 10th Light Horse Regiment Headquarters, Machine Gun Section, "A" and "B" Squadrons embarked on the HMAT A47 Mashobra from Fremantle, Western Australia, 8 February 1915. 10th Light Horse Regiment "C" Squadron embarked on the HMAT A52 Surada from Fremantle, Western Australia, 17 February 1915. 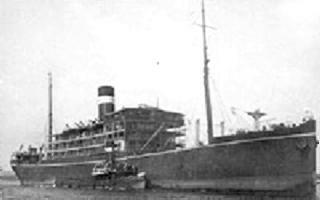 The 10th Light Horse Regiment sailed to Egypt and disembarked on 8 March 1915. The earlier systems proved to be ineffective so to assist with identification of the men in the various units within the AIF, Divisional Order No 81 (A) Administration was issued at Mena on 8 March 1915 detailing the Colour Patch for the 10th Light Horse Regiment as others received their colours. The colour patch was made of cloth 1¼ inches wide and 2¾ inches long and worn on the sleeve one inch below the shoulder seam. The colour patch for the 10th Light Horse Regiment was black over yellow. The 10th Light Horse Regiment carried the yellow Brigade colour as the lower triangle part of the colour patch, while the black unit colour was on the top. This is illustrated with the above presentation. As mounted troops, the Light Horse was considered to be unsuitable for work in Gallipoli. The mounted troops volunteered to operate as infantry and thus were sent to Gallipoli with the 10th Light Horse Regiment landing on 20 May 1915. The Regiment was deployed on primarily defensive activities at Russel's Top and Rhododendron Spur throughout the stay at Gallipoli. The 10th Light Horse Regiment participated in the ill fated charge at the Nek on 7 August 1915 where most of the Regiment was either killed or wounded. The 10th Light Horse Regiment participated in the attack at Hill 60 on 27 August 1915. The 10th Light Horse Regiment left the peninsula on 20 December 1915. After the return to Egypt, the 10th Light Horse Regiment reformed and re-equipped. The reorganisation of the Light Horse led to the formation of the ANZAC Mounted Division to which the 10th Light Horse Regiment became a foundation member. On 28 February 1916, the 10th Light Horse Regiment moved to join its parent brigade, the 3rd Australian Light Horse Brigade, which was taking part in the defence of the Suez Canal. The work was hot and monotonous. They remained here until moved to the Romani region to bolster the defence of that area. The 3rd Australian Light Horse Brigade played an important role in beating back the Turkish invasion of the Suez Canal zone at Romani. Now known as the Battle of Romani which lasted from 4-6 August which was quickly followed by the Battle of Katia and then Bir el Abd on 9 August. All the actions in which the 10th Light Horse Regiment finally led to the defeat of the Ottoman Canal Expeditionary force and its retreat to Bir el Mazar. Over the next few months, the 10th Light Horse Regiment took part in the Allied advance over the Sinai leading to the fall of Bir el Mazar, then El Arish followed by Bir el Magdhaba and finally Rafa in January 1917. The Ottoman forces were expelled from the Sinai and were poised to be tackled in Palestine. On 27 March 1917, the 10th Light Horse Regiment took part in the First Battle of Gaza. While involved in the encirclement of the city as a prelude to its capture, the 10th Light Horse Regiment received the order to withdraw and return to the starting line. Grudgingly they did so but realised the Turks had snatched victory out of the jaws of defeat. The 10th Light Horse Regiment took part in the Second Battle of Gaza on 19 April 1917 and suffered the heaviest casualties since Gallipoli. The 10th Light Horse Regiment took part in the Battle of Beersheba and then the follow up actions that lasted until early January 1918. From this time onwards, for the next two months, the 10th Light Horse Regiment remained in continuous combat action until relieved for three months refit and training at Deir el Belah from early January 1918. In early April 1918, the 10th Light Horse Regiment moved into the Jordan Valley and took part in the invasion of Moab and took Es Salt during the action of 30 April – 4 May 1918. Unfortunately, due to a Turkish attack on the lines of communication, this raid nearly turned into a disaster where the Turkish forces almost cut off the Australian Mounted Division in the hills. In a move that converted the Light Horse into full cavalry, the Australian Mounted Division was issued with swords during August and early September 1917. The Australian Mounted Division went to work training with swords and undertaking cavalry work. On 19 September 1918 the Battle of Megiddo began. The infantry over ran the Turkish defensive trenches allowing the cavalry to debouch into the Turkish hinterland. The 10th Light Horse Regiment participated in the breakthrough which moved rapidly through the north of Palestine. At the end of the first week, it was obvious that the way to Damascus was open and so a second push occurred on the heels of the first assault. On 1 October 1918, Damascus was taken. As part of the 3rd Light Horse Brigade, they marched through the city after its surrender by the Sarai. After a rest in Damascus, the 10th Light Horse Regiment moved towards Homs when the Turks surrendered on 30 October 1918. After the conclusion of hostilities, the 10th Light Horse Regiment was marked to return to Australia. Prior to that action, one of the saddest actions occurred for the Australian Lighthorsemen, they had to farewell their best friends, the horses. All the Light Horse unit horses' health was ascertained with the fit horses being transferred to the Indian Cavalry while those in poor condition were destroyed by the Veterinary units. On 13 March 1919 the 10th Light Horse Regiment was deployed to assist in suppressing the Egyptian Uprising. When the revolt collapsed, the 10th Light Horse Regiment embarked on the 10 July 1919 for the long voyage to Australia where the unit was disbanded. 10th Light Horse Regiment War Diaries. 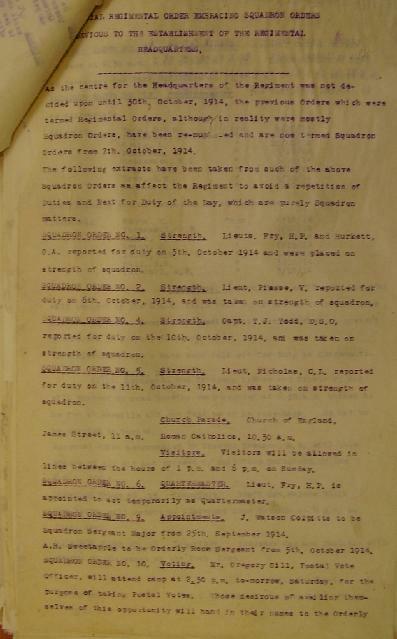 The following list details all the embarkations in support of the 10th Light Horse Regiment, AIF, during the Great War. Each entry details to formation and the ships on which the units embarked with the date and place of embarkation. The detail of the formation is linked to a list of men who embarked upon that ship on the specific date.